Recently, UCLA’s Center for 17th-&18th-Century Studies and William Andrews Clark Memorial Library received support for an endowed fellowship from antiquarian bookseller, philanthropist, and long time supporter, Kenneth Karmiole. The gift of $100,000 will establish the Kenneth Karmiole Endowed Research Fellowship, supporting an annual graduate fellowship at UCLA’s William Andrews Clark Memorial Library, which serves as the research laboratory for a distinguished array of fellows working in the library’s collections. The Clark’s major sub-collections include Tudor & Early Stuart, Long Eighteenth Century, Oscar Wilde & the fin de siècle, Book Arts, and Montana and the West. The endowed fellowship will be used for research for one month on any subject, and fellows will present on their research upon completion of their residency at the Clark Library. This is Karmiole’s second endowment to UCLA’s Center for 17th- & 18th-Century Studies and Clark Library. In 2004 he established The Kenneth Karmiole Lecture Series on the History of the Book Trade. The series focuses on the book trade in England and Europe during the 17th and 18th centuries, highlighting the Clark’s rich collection of materials relating to the collecting, publishing, and dissemination of books in the early modern period. Karmiole has been a long-time supporter of rare book studies at UCLA. In addition to gifts to the Center and Clark Library, he has established a handful of generous endowments for UCLA’s Graduate School of Education and Information Studies (GSE&IS) and the UCLA Library. 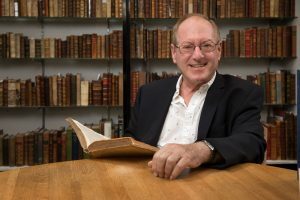 His contributions include the Kenneth Karmiole Fellowship established in 2002 to support students studying rare books and manuscripts, and the Kenneth Karmiole Endowment for Rare Books and Manuscripts established in 2006 to finance the acquisition of special collections throughout UCLA’s libraries. An antiquarian bookseller, Karmiole graduated from GSE&IS with a Master of Library Science, and has owned his own business since 1976. His current storefront, which he has operated since 1986, is located in Santa Monica. Karmiole is considered an authority on early printed books, science, medicine and technology, and the history of printing. UCLA’s Center for 17th-&18th-Century Studies and Clark Library are deeply grateful for Ken Karmiole’s partnership in supporting and enhancing graduate education and for his philanthropic leadership, both of which are crucial to sustaining UCLA as one of the nation’s leading public institutions.